Gesture controls are clearly the next step toward the futuristic computing interfaces of tomorrow, but in their current state, they’re a bit lacking. We’re not quite at that Minority Report level we’ve been chasing since 2002 – but we’re getting closer. The problem is that the most advanced gesture-control systems still detect movements with cameras, which isn’t exactly ideal. The effectiveness of these systems hinges on extremely sophisticated gesture-recognition algorithms, which often have detection problems at large distances or varying light conditions. Thalmic Labs approaches the problem in a different way. 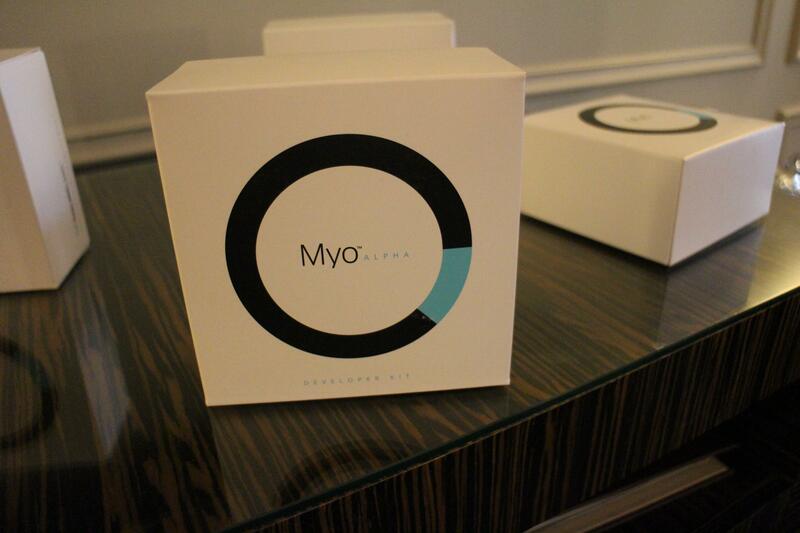 Rather than detecting motions and gestures with cameras, Myo analyzes muscle activity in your forearm. Using a process called electromyography (EMG), the device can gather extremely detailed information about which muscles in your arm are tensed, as well as the degree to which they are tensed. Using this information, Myo can reliably discern what position your hand is in, giving it a huge advantage over camera-based gesture recognition, which often struggles with detecting the position of individual digits. By using EMG in tandem with a nine-axis inertial measurement unit (also known as an IMU, comprised of a three-axis accelerometer, three-axis gyroscope, and a three-axis magnetometer) Myo is able to understand a wide array of different hand gestures, along with the speed, direction, and angle of your arm. And since it’s designed to be worn on the arm and carried around, it allows you to interface with a wider range of objects – not just ones that have gesture-recognizing cameras built into them. The idea has a lot of promise for moving gesture control forward, but in order to dethrone the camera-based model, it needs to perform better. Gesture recognition and the action that’s executed afterward need to be seamless. The good news is that it totally is. 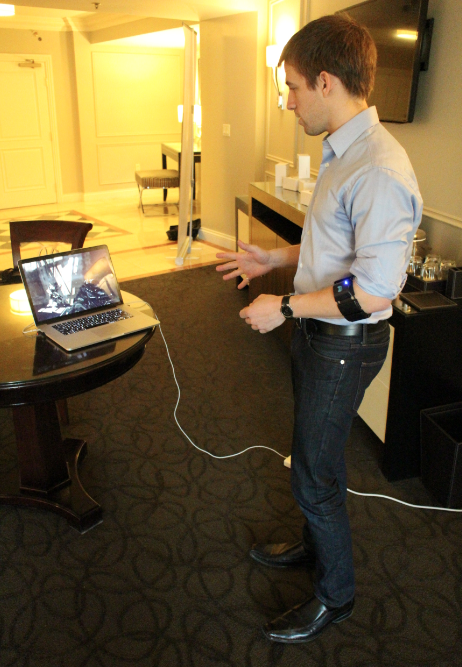 We were absolutely blown away by the live demo Thalmic founders Stephen Lake and Aaron Grant gave us. They started off with a game of Call of Duty, using two Myo armbands to dictate the player’s movements onscreen. The responsiveness was stunning. When Aaron moved his arms, rotated his body, or gently squeezed his trigger finger, the corresponding action onscreen was instantaneous. No delays, no flailing your arms in vain. Myo registered every gesture in what must’ve been just a few nanoseconds, and never faltered once. After that they showed us a few other potential uses – things like controlling a powerpoint presentation with swipes, or turning the volume up on iTunes by rotating a closed fist. It wasn’t quite as impressive as the Call of Duty demo, but the point had already been proven – Myo is hands down the most sophisticated gesture control device in the biz, and is far superior to any camera-based system we’ve ever encountered. After playing around with it for the better part of an hour, we are totally convinced that this is the future of in-air gesture control. It’s currently available for pre-order for just $149, and Lake tells us Thalmic expects to ship them to consumers by mid-2014. For more information, check out their website.